Animal Behaviorists Vince Rose and Cherie promptly went to the school where they were met by the school’s Vice-Principal, Mr. Hector Trejo, carrying a flour sack that seemed to have a life of its own. 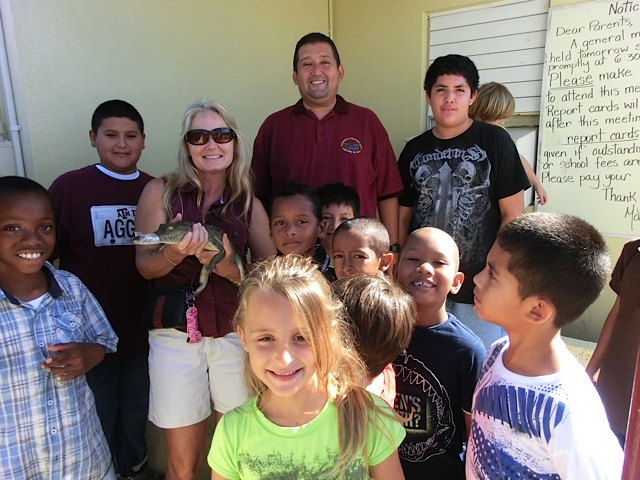 The children were very excited to see the little croc, so with the permission of Mr. Trejo, the children present got to pose with the three foot reptile they named “Bonita” or “Bonito” if the croc turns out to be a male. “I commend all those involved in this crocs rescue. They most likely did save the croc’s life because according to Mrs. Martinez it was very far from the lagoon and was believed to possibly come from under someone’s home. Additionally, they are great role model for the children at the school in putting the animal’s welfare first,” stated Cherie. “The croc is extremely healthy and will be held in captivity for a few days to determine if it was possibly someone’s “pet” and too used to humans. If so, it will be rehabilitated and desensitized to humans. ACES will be sure that it can catch its own fish, shrimp and crabs before it is tagged with a microchip and re-released in a remote location”. Space and cost keeping children out of school?